Shock Your Body With LADDERS! As you probably already know, the typical interval workout features a single interval protocol with a static work and rest period. For example, a 30-30 interval workout consists of alternating between 30 seconds of work and 30 seconds of rest with a 1:1 work to rest ratio. Is there anything wrong with this format? It's a very straight forward and basic approach to interval training and it will deliver great results. However, sometimes it's fun to mix things up a bit and actually change-up the intervals within the same workout. In other words, you can also incorporate multiple and dynamic interval protocols within one main interval workout. In fact, this method provides an excellent shock to the body to help you break through any frustrating training plateaus. One way to accomplish this is through ladder interval protocols. Timed Ladders involve moving up, down, or both up and down a proverbial ladder of work periods of various lengths and/or work to rest ratios. Please note that even though all of the above examples have a 1:1 work to rest ratio throughout, that's not necessary to make it a ladder interval protocol. Rather it's simply one way to do it and is a bit easier to comprehend versus changing both the length of the work periods and the work to rest ratios. In addition, you can either perform a ladder interval protocol for a single exercise at a time for straight sets or combine multiple exercises in an alternating set format of supersets, trisets or circuits- the options are endless. Another cool twist on the ladder interval format is called a Movement Ladders where you basically add or subtract a certain number of movements in each subsequent round. You could also start with 5 consecutive exercises and subtract a single exercise each subsequent round as well or even add or subtract multiple exercises each subsequent round if desired. Maximum Intensity Work Periods of 0-10 seconds primarily involve your anaerobic alactate energy system (without the presence of oxygen or lactic acid) and burns mostly your phosphagen fuel stores including Adenosine Triphosphate (ATP) and Creatine-Phosphate (CP). These work periods are also best suited for maximum strength, speed, and power training and primarily work your fast-twitch muscle fibers. High-Intensity Work Periods of specifically 30-60 seconds and up to 2 minutes primarily involve your anaerobic lactate/glycolytic energy system (without the presence of oxygen but with the presence of lactic acid) and burns proportionately more sugar/carbohydrate for fuel. These work periods also primarily stimulate lean muscle gain and strength and power endurance and are best characterized by very high levels of muscular fatigue when lactic acid levels peak. They also use a mix of both fast twitch and slow twitch muscle fibers. Low to Moderate Intensity Work Periods of 2-3+ Minutes primarily involve your aerobic energy system (with the presence of oxygen) which burns proportionately more fat for fuel. These prolonged work periods build work capacity and muscular endurance and promote recovery between higher intensity work periods of shorter duration. They also primarily work your slow twitch muscle fibers. It is important to note that ALL 3 of your energy systems are active at all times. However, depending on the length of the work period and the intensity utilized, one system is always more active than the others. – A movement ladder allows you to place higher-priority movements earlier in the ladder to get more work on them and strengthen your weaknesses. For example, if your right leg is stronger than your left leg, place left leg movements earlier in the ladder to achieve greater training volume and to help eliminate the strength imbalance. Remember, the key to continual results is switching it up every 3-4 weeks and clearly ladder intervals are a great way to do just that! Tasty Halloween Recipes – No-Tricks Here! Here's one of my new faves – Creamy Pumpkin Shake from our No-Tricks Here Halloween Cookbook. Put the ingredients in a blender, blend away, pour into a glass and enjoy. Top with whipped cream and Pumpkin Pie spice for added flavor. FREAKY FAT LOSS CHARITY WORKOUT!! Don't forget! 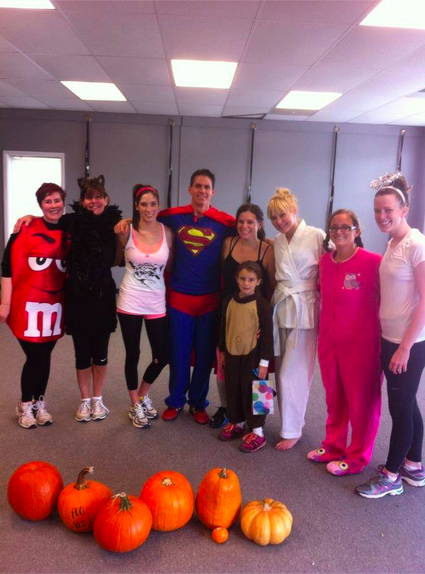 We are holding our 4th annual Freaky Fat Loss Halloween Pumpkin Workout to raise money for a local organization. This year we are proud to partner with the people at the Make-A-Wish foundation, who grants the wishes of terminally ill children. Wear a costume! Bring the kids! Food will be served! Tasty Halloween Recipes – No Tricks Here! 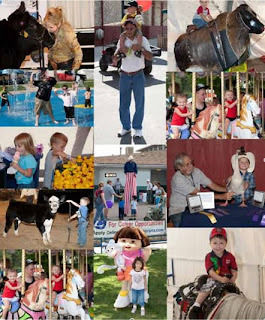 The State Fair Survival Guide: How To Fare Well at The Fair! It's State Fair time again, so how do you maintain the whole "healthy choices" when all your faced with are snickers,bacon & every sugar snack deep-fried and put on a stick? Fairs involve a lot of walking, so we'll probably burn off those extra fair food calories right? Maybe…If we walk up to 1.5 miles for a bag of cotton candy and three miles for a funnel cake! Big portions with lots of sugar and fat calores characterize many of the foods we traditionally associate with fairs. For many o fus, attending the fair would be nearly as much fun without these tasty treats. Some may be once-a-year food for us; I can literally taste the candy apples right now! So how much exercise does it take to walk off our favorite fair foods? We know on average, we have to walk about one mile to burn 100 calories. To visualize how far that is, think approximately 12 city blocks to the mile. While calores per favorite fair food can depend on portion size, recipe, and more, burning off the calories of that cotton candy mentioned above could be an 18-block walk. Quench your thirst with a small soft drink rather than large. Better yet, buy or bring bottled water. Save your fair-day calories for something else. Split foods among several people. For example, share a large funnel cake with friends. Everyone gets a taste, and no gets overloaded. Plan times when you'll sit down and eat, rather than graze your way from one end of the fair to the other. It's hard to keep a handle on howmuch we're eating when we're walking, talking and eating at the same time. Limite yourself to one treat. Choose reasonable serving sizes of lower sugar and lower fat items for the rest of your foods. Dress in comfortable shoes so you're more likely to walk off some calories. Wear a pedometer and see how many steps you can take at the fair. One mile equals about 2,000 steps, or around 1/3 of the calories in a typical caramel apple. Check out all the food booths before making your selections. Imaging you have a "calorie salary". Enjoy the foods you like the most for your "salary". Finally, if you do indulge a little too much, remember to return to a more balanced way of eating the next day. A day or two of overeating won't affect our weight that much – weeks of it will! Eating 100 extra calories daily can result in a 10-lb weight gain yearly. How To Go NUTS For Fat Loss! But there is a method behind my madness when it comes to all things coconut. It's a bit overused, in my opinion, but coconut oil is truly one of the few foods that literally can be said to be a "superfood"
#1 – The Fat Burning Fat – Coconut Oil is one of nature's most healthy saturated fats. The type of fat that your body needs. It also has a huge thermogenic effect. Study after study shows the impact that adding coconut to your diet can cause. In cases of individuals who were obese, coconut oil was demonstrated to cause a 48-63% increase in metabolism and that metabolic boost lasted up to 24 hours helping patients burn off stored body fat. #2 – Nature's Quick-Energy – I mentioned that it was a satured fat, but not like other saturated fats. Most are categorized as long-chain fatty acids, but coconut oil is a medium-chain fatty acid which means it is metabolized differently. When we consume this 'superfood' it goes straight to the liver to be used for a quick source of energy. Healthy fats such as this are actually a preferred fuel source for our body. #3 – Mind, Metabolism, & Medicine – Throughout history, coconut oil has been used to heal wounds because of it's ability to accelerate tissue repair. But in recent times, it's medicinal benefits has reached new heights in it's benefits in alzheimer's patients. The famous 2006 study in the journal Neurobiology of Aging discovered the medium-chain triglycerides found in coconuts resulted in immediate cognitive improvement within only 90 minutes. Brain-Boosting, Fat-Burning, Energy-Enhancing Coconut Oil! In Part 1, I explained the “ADRENALINE” aspect of ADRENALINE ABS. Click HERE in case you missed it. In Part 2, I explained the “ABS” aspect of ADRENALINE ABS. Click HERE in case you missed it. – I decided to go with 10-second work periods instead of the 8-second work periods utilized in Boutcher’s study because of the fact that I’ve found the extra couple of seconds best allows people of all fitness levels to get enough muscular contractions to achieve the desired training effect in a bootcamp setting. In other words, since we’re not using a stationary bike like in Boutcher’s study, 10 seconds works a bit better than 8 seconds for resistance training exercises. – I used a 5-second rest and transition between the total body and core exercises because I found that was all the time that was needed to transition from floor-based to standing exercises and be ready crank it for the next set. In fact, part of the conditioning of this workout template is that you will need to get up off of the floor and down on the floor at least 60 total times within 20 minutes. This up-down aspect gets really taxing by the end of the workout. Plus, successfully going up and down is quite functional for contact-based sports and every day activities. – It’s also interesting to note that since we are supersetting between 10-seconds of maximum effort for a total body and core exercises with a 5-second rest and transition, the 1 to 1.5 work to rest ratio from the “magical” stubborn fat burning 8-12 interval protocol in Boutcher’s study is achieved. In other words, there is 15 seconds before you repeat each 10-second exercise again best allowing for maximum intensity since the total body and core exercises are non-competitive in nature. – There is a 1-minute rest and transition between each 5-minute station to allow for a bit of recovery to prevent any performance drops as the workout progresses. This is also a great time to grab a swig of water and wipe yourself down with a towel or too… I know I had to, ha ha! ADRENALINE ABS- 20 minutes: Alternate between 10 seconds of maximum effort for a total body exercise and a core stability exercise with a short 5-second transition between exercises. Perform for 5 straight minutes followed by a 1-minute rest and transition. The workout ends with a surprise finisher consisting of 2-minutes of continuous work for a total body exercise. If you like what you heard and saw and want more ADRENALINE ABS, check out the options below and see what works best for you! Contact Us Today at 501-425-0661 or Email Us at support@fastfitbootcamps.com to Get Started Immediately! Get ADRENALINE ABS shipped right to your smartphone, tablet or device. ADRENALINE ABS is a cutting-edge program that we’re using in our program at FastFit that features a fusion of 10-second total body exercises to boost adrenaline and burn stubborn fat and 10-second core stability exercises to build flat, rock hard abs. Adrenaline is a specific hormone that belongs in the general category of hormones called catecholamines. Catecholamines are basically your “fight or flight” hormones that get released into your blood stream in response to large stressors like being chased by bears, riding an insane roller coaster, or during very intense exercise or activities. In a study lead by an Australian researcher by the name of Professor Steven Boutcher at the University of South Wales in 2007, it was discovered that short, max-intensity intervals resulted in greater fat loss than long, slow, boring cardio. The study basically took a pool of 45 obese women and broke them into two separate groups with distinct exercise protocols. One group performed three short 20-minute high-intensity interval training workouts per week consisting of an 8 second maximum effort and 12 second active recovery interval protocol. The other group perform three 40-minute steady-state aerobic workouts per week. There was also no change in diet for either group so exercise was the only variable in the study. After 15 weeks researchers discovered that even though the aerobic group exercised for twice as long as the interval group, the interval group lost more body fat, specifically in the most stubborn areas of the belly, hips, and thighs. Boutcher concluded that this increased fat loss was due to a larger release of catecholamines with the interval group. “The group which did around eight seconds of sprinting on a bike, followed by 12 seconds of exercising lightly for twenty minutes, lost three times as much fat as other women, who exercised at a continuous, regular pace for 40 minutes,” said Boutcher. But why did they initially choose these really short intervals? After all, what was so magical about this 8-12 interval protocol? There were again two unique test groups. One group performed a shorter 8 s of work, 12 s of recovery interval protocol for 20 minutes while the other group performed a longer 24 s of work, 36 s of recovery interval protocol. Researchers discovered that the shorter interval group realized both greater energy expenditure and oxygen uptake than the the longer interval group. In other words, even though the total work time was the same in each group, the shorter interval group burnt more calories and had a higher metabolic disturbance. This is due to the fact that shorter intervals allow for higher overall intensity levels and intensity is truly what makes the body change. Another benefit of shorter intervals is that they provide a lower perceived exertion than longer intervals. Though these studies use a bike as the exercise mode, I prefer to use total body exercises instead to jack adrenaline levels through the roof. Total body exercises integrate multiple movement patterns or simultaneously call upon your upper and lower body thus resulting in maximum heart rate elevation and the optimal fat-burning, muscle-building stimulus. Classic total body exercise examples include squat to presses, swings, and explosive olympic lifting variations like cleans, snatches, jerks, etc. In addition, traditional cardiovascular locomotive and plyometric exercise variations like running, leaping, hopping, skipping, bounding, jumping, shuffling, etc. also fit under this category. I think it’s also critical to add that power training movements develop and sustain the all-important fast-twitch, Type II-B muscle fibers. Well, Type II-B muscle fibers are the first to begin to and continue to atrophy in your 30’s and 40’s. These powerful fast twitch fibers are also the biggest and strongest muscles in your body so if they wither away so will your strength and metabolism. Stay tuned for the “ABS” section of ADRENALINE ABS later in the week! Combine all ingredients in a blender and process until smooth. You can add ice while blending if desired.